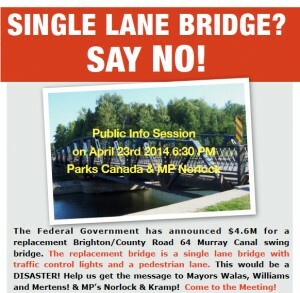 MP Rick Norlock has announced the single lane bridge plan has been put on hold until 2015. The announcement is not specific about the date. The reason for the delay is to allow time to find the funds to build a two lane bridge. Since the existing bridge must still be replaced, funds must be found or a single lane bridge could still be built. A single lane bridge is a grave threat to the economic, tourism, and agricultural health of Brighton, Quinte West and Prince Edward County. We are working with the Federal Government, Parks Canada and our local Municipalities to find a way to get The Bridge We Need. We are working to ensure the right bridge gets built. Join us by registering at right to help us get this solved. Please see our Welcome Page to learn about the Murray Canal District Organization, it’s purpose and goals. 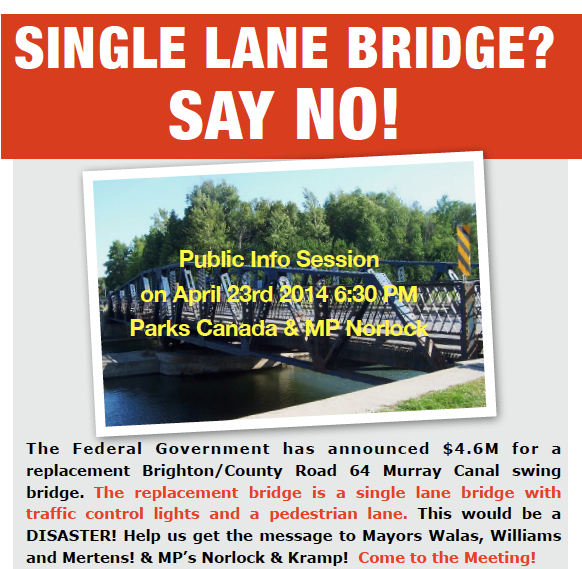 We have achieved getting the Federal Government to suspend its plan for a single-lane replacement swing bridge. Now our immediate priority is building relationships and encouraging dialog to find the funds to build the right bridge. Now You can learn more about this issue by reviewing our Breaking News posts.